Find the MEGA egg and win a $100 Visa Gift Card! 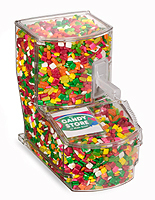 Are you in search of candy bins to outfit a new store? 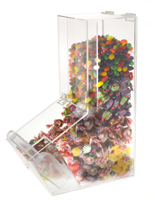 Are you uncertain which type of dispenser is best suited for your food institution? 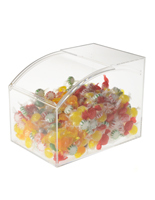 These acrylic candy bins are suitable for a wide range of locations such as; gift shops, restaurants, hotels and other retail locations. Will you need several food dispensers? 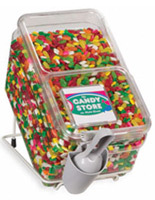 As one of the largest online retailers in this industry; there are always a plethora of bulk candy bins in stock and ready to ship! The current quantity in stock is also listed on every product page, so there is no guessing if the item is available. 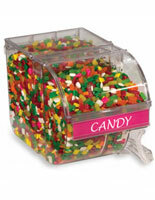 Acrylic candy bins and candy displays make great scoop bins. These bulk containers also help to keep foods organized and fresh. 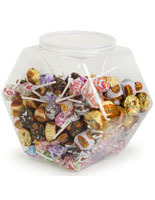 Choose from this large selection of candy bins with scoop that includes multiple sizes. 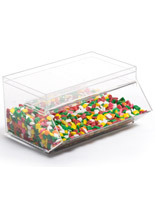 These food containers are great as bulk displays, storage bins, or as acrylic gravity dispensers. 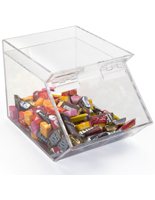 Some of these candy bins feature superior qualities such as: NSF approval, tight fitting lids which maintain freshness, label holders for quick change of titles, and stain resistant polycarbonate that will not yellow, chip, crack, or craze like acrylic. Several of these scoop displays have sliding doors that stay up while in use, then close quickly to maintain freshness. 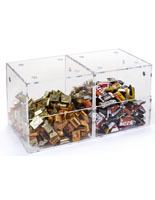 These bulk food bins are offered in several shapes and designs. 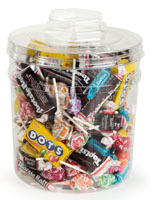 Choose from open bottom containers that are suitable for unwrapped candies or other small food items. One of the newer acrylic bins that includes a scoop, are these containers with a built-in slot. These bulk dispensers feature a small "pocket" that allows users to insert the scoop when not in use. 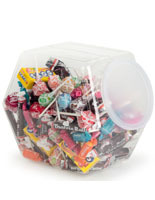 This feature allows for the lid on the candy bins to remain completely shut when not in use, allowing the contents to remain fresh. 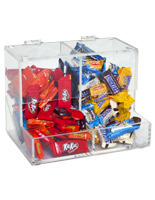 To find candy bins that meet your needs click any of these products above. 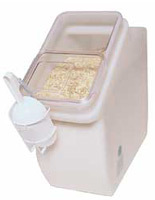 Another popular design is the bulk container with an external scoop holder. 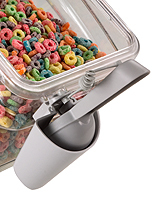 This food bin with a scoop features a holder mounted to the front of the display that houses the utensil. Much like the smaller food containers mentioned above; this design also promotes product freshness by keeping the lid shut when not in use. 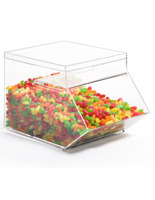 This candy bin design is popular among bulk food stores, restaurants and other establishments that buy in bulk quantities. For shops that also sell unwrapped candies and treats there are a couple of options offered here that are suitable for this type of product. 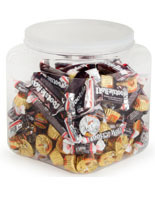 The candy bin features a hinged lid to allow easy access to refill the container. There is a small reservoir at the bottom of the dispenser that allows customers to serve themselves. 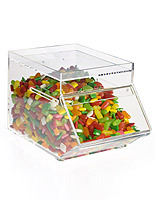 This acrylic candy bin is not intended for use with bulk foods that are not wrapped as there is no lid or cover to keep the items protected. Use this food dispenser in a convenient store as an impulse-buy display at the register. 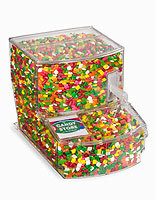 Bulk candy bins are a great means of not only offering a wide range of products, but it also allows shoppers to have a little fun while making their selection. This selection of bulk dispensers with and without a scoop is diverse and can be used in a wide array of environments. A bulk food storage bin saves on cleanup as well as employees having to serve customers. Shop owners should be aware of the volume of business that they anticipate in choosing these dispensers. 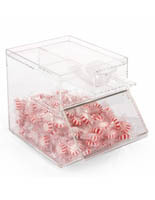 An acrylic candy bin that is too small will require frequent filling, while a container that is too large will take up space. 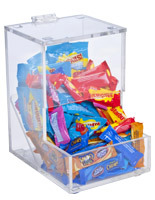 No matter what bulk candy bin you ultimately purchase here; shoppers will certainly get a quality product that will help to increase your sales! Buy today! Are any of these scoop bins dishwasher safe? 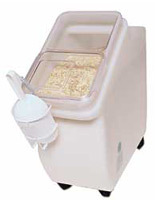 Many of the bulk food dispensers shown here are dishwasher safe, or can be hand washed with mild soap and warm water. The scoop bins for sale on this site that don't mention dishwasher safe on the product page should not be placed in a dishwasher. For more detailed information regarding any of the food containers offered on this site please read the product details page, or feel free to contact a friendly member of our call center staff. Can extra utensils be purchased for the scoop bin displays show here? 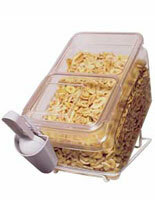 Many of the bulk food containers offered here come with one included serving utensil. 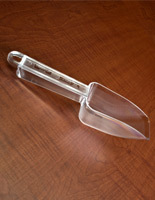 For customers buying a scoop bin that does not include any type of utensil; scoops and tongs are offered on this site in various sizes and designs. Some of the acrylic bulk food containers and gravity-fed dispensers sold here are designed to not require a scoop or tongs. Want to purchase extra scoop bins or tongs? Individual units are available in this category as well. Many of the scoops that come with these displays are unattached, so there is the chance that they can get lost. 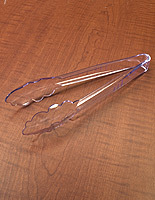 Purchase backups so replacements are always readily available, and you'll avoid customers using their hands to reach in and grab food or candy.Tongs with scalloped edges are ideal for grabbing bagels and bread. 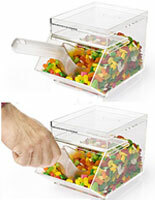 Any buffet or candy shop will benefit from adding scoops and serving tongs to self serve bins.